VALCOURT, Que. -- BRP Inc. (DOO.TO) says its fourth-quarter revenue was up 22.8 per cent from a year earlier, beating analyst estimates and propelling the Quebec-based company's three-month profit to $82.7 million. 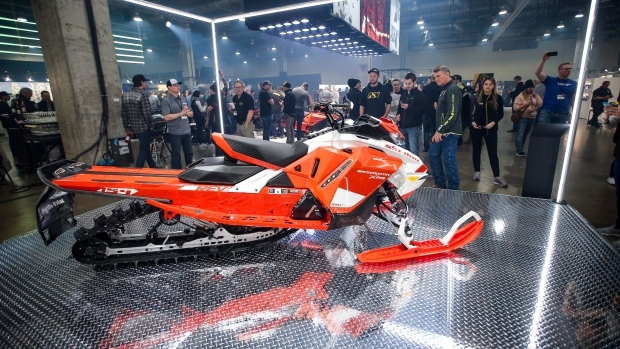 The maker of Ski-Doo snowmobiles, Can-Am wheeled vehicles, boats, outboard motors and other recreational products says its fourth-quarter profit amounted to 84 cents a share, up 23.5 per cent from a year earlier. Based in Valcourt, Que., BRP says its revenue for the three months ending Jan. 31 was $1.51 billion, up from $1.23 billion a year earlier, due mostly to higher wholesale sales of its seasonal and year-round products. Favourable currency rates also contributed $38 million to the revenue increase. BRP's normalized net income was $85.8 million or 88 cents per share. Analysts had estimated 83 cents per share of adjusted earnings and $1.41 billion of revenue, according to Thomson Reuters Eikon.